The system will be subjected to a lot of bumps, weather conditions, and stresses on wires. Solder and crimp all connections for good electrical and mechanical connections. Cover connections with heat shrink tubing when appropriate; no electrical tape and no wire nuts! Stress relief all wiring, especially the thin wires coming out of the strobe. Use lock nuts, lock washers, or Loctite, on bolts. Some basic tools are needed to construct a lighting system. A heat gun is best for shrinking heat shrinkable tubing, but if you are careful you can use a butane lighter held a safe distance from the tubing (don't set it on fire!). Sealed lead acid and NiMH batteries are capable of supplying large amounts of current. A short from + to - could result in a fire as the wire insulation melts. You need to have a fuse as close to the battery terminals as possible. Use a mini-blade fuse with a weatherproof holder. The old spring loaded, inline, 3AG fuse holders are very troublesome and in fact were a major point of failure in lighting systems that I used to manufacture (the plastic tabs would break off one side and the two sides could no longer be locked together). A 10 amp fuse is a good choice. Carry spare fuses, but of course figure out the cause of the fuse blowing before replacing it. Buy multi-conductor wire in a sheath. This is available by the foot at Home Depot. Sheathed wire looks much neater than using multiple single conductor wires and twisting them or cable tying them together. For the headlights buy four conductor 18 gauge stranded wire. For the tail light buy two conductor 22 gauge stranded wire. For the battery to the switch box buy 2 conductor 18 gauge stranded wire. For headlamps greater than 25W use 16 gauge wire. If the headlamp wattage total is greater than 25W use 16 gauge wire from the battery to the switch box; but for two 20W lamps you can run 18 gauge to each from the switch box. These wire gauges apply to 12 volt systems. For a 6 volt system you will need larger gauge (smaller number) wire because you will be drawing more current for the same wattage. If you use individual wires then consider using black plastic wire loom over the wires. Attach one connector to the battery with the male side fused. 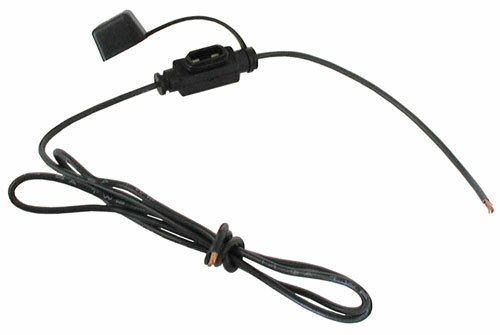 Attach a connector to each lamp, the polarity on the battery, charger, and tail light matters. There is no polarity on the headlamps. The three connectors for the lights are switched, the one for the battery is not. Be sure to get the polarity of the charger and battery connectors correct. Be sure to get the polarity of the switch box to tail light correct.